Saint Vincent and the Grenadines is an independent sovereign state in the Lesser Antilles chain of the Caribbean Sea. Its 389- km² territory consists of the main island of Saint Vincent and the northern two-thirds of the Grenadines. The country has a British colonial history and now part of the Commonwealth of Nations and CARICOM. Its capital is at Kingstown on Saint Vincent. 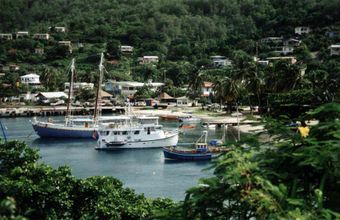 Carib Indians aggressively prevented European settlement on St. Vincent until the 18th century. Enslaved Africans -- whether shipwrecked or escaped from Barbados, St. Lucia and Grenada and seeking refuge in mainland St. Vincent, or Hairoun as it was originally named by the Caribs -- intermarried with the Caribs and became known as Garifuna or Black Caribs. Beginning in 1719, French settlers cultivated coffee, tobacco, indigo, cotton, and sugar on plantations worked by enslaved Africans. In 1763, St. Vincent was ceded to Britain. Restored to French rule in 1779, St. Vincent was regained by the British under the Treaty of Paris (1783) in which Great Britain officially recognized the end of the American Revolution. Ancillary treaties were also signed with France and Spain, known as the Treaties of Versailles of 1783, part of which put St. Vincent back under British control. Conflict between the British and the Black Caribs, led by defiant Paramount Chief Joseph Chatoyer, continued until 1796, when General Sir Ralph Abercromby crushed a revolt fomented by the French radical Victor Hugues. More than 5,000 Black Caribs were eventually deported to Roatán, an island off the coast of Honduras. Natural disasters have featured in the country's history. In 1902, La Soufrière volcano erupted, killing 2,000 people. Much farmland was damaged, and the economy deteriorated. In April 1979, La Soufrière erupted again. Although no one was killed, thousands had to be evacuated, and there was extensive agricultural damage. In 1980 and 1987, hurricanes compromised banana and coconut plantations; 1998 and 1999 also saw very active hurricane seasons, with Hurricane Lenny in 1999 causing extensive damage to the west coast of the island. 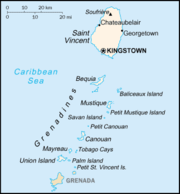 St. Vincent and the Grenadines is a parliamentary democracy within the Commonwealth of Nations. Queen Elizabeth II is head of state and is represented on the island by a governor general, an office with mostly ceremonial functions. Control of the government rests with the prime minister and the cabinet. There is a parliamentary opposition made of the largest minority stakeholder in general elections, headed by the leader of the opposition. Saint Vincent and the Grenadines is lies between Saint Lucia and Grenada in the Windward Islands of the Lesser Antilles, an island arc of the Caribbean Sea. The islands of Saint Vincent and the Grenadines include include the main island of Saint Vincent (344 km²) and the northern two-thirds of the Grenadines (45 km²), a chain of small islands stretching south from Saint Vincent to Grenada. Agriculture, dominated by banana production, is the most important sector of this lower-middle-income economy. The services sector, based mostly on a growing tourist industry, is also important. The government has been relatively unsuccessful at introducing new industries, and a high unemployment rate of 22% continues. The continuing dependence on a single crop represents the biggest obstacle to the islands' development; tropical storms wiped out substantial portions of crops in both 1994 and 1995. The tourism sector has considerable potential for development over the next decade. Recent growth has been stimulated by strong activity in the construction sector and an improvement in tourism. There is a small manufacturing sector and a small offshore financial sector whose particularly restrictive secrecy laws have caused some international concern. Most Vincentians are the descendants of African slaves brought to the island to work on plantations. There also are a few white descendants of English colonists, as well as some East Indians, Carib Indians, and a sizable minority of mixed race. The country's official language is English. St. Vincent has a high rate of emigration. With extremely high unemployment and under-employment, population growth remains a major problem. In 2005, St. Vincent and the Grenadines had 22,500 telephone land lines. Its land telephone system is fully automatic and covers the entire island and all of the inhabited Grenadine islands. In 2004, there were 57,000 mobile phones. There is mobile phone coverage for most of St. Vincent as well as the Grenadines. In 2004 it had seven radio stations (1 AM, 6 FM). It has one television broadcast station. The country has two ISP's: Cable and Wireless and Karib Kable.